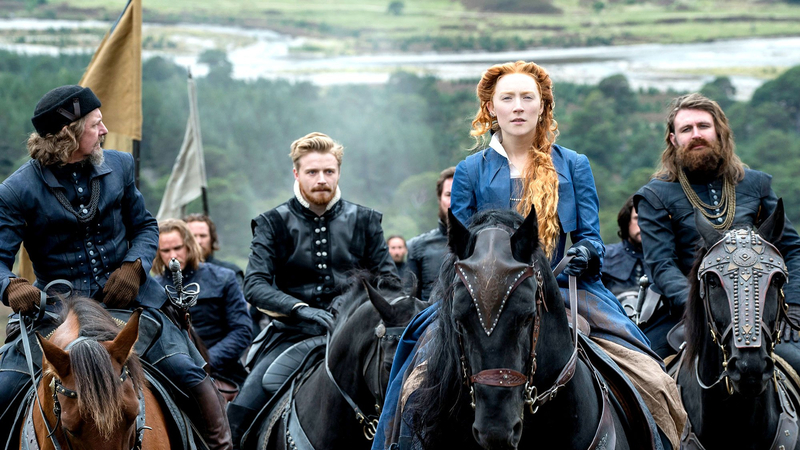 Josie Rourke’s Mary Queen of Scots is the latest attempt to tell the well-worn story of Mary Stuart, who challenged the protestant hold on the English throne under Elizabeth I. Starring Saoirse Ronan in the titular role and Margot Robbie as Elizabeth it is, in short, two hours of overwrought, stagey nonsense that somehow fails to avoid also being deathly dull. The film sets out its stall early on. The story is of two strong women, rivals for the throne, and the decision to cast people of colour in key supporting roles (Gemma Chan as Elizabeth Hardwick, Ismael Cruz Córdova as David Rizzio, and Adrian Lester as the Queen’s emissary in Scotland) is interesting and timely. It suggests that the film is willing to find parallels with modern culture, modern Britain, that never materialise. Instead, the film wears its historical iconoclasm without much interest in interrogating it. The case for casting more POC in historical dramas has been well made (as has the case for producing more dramatisations of history that included POC) and is very worthwhile, but here it is symptomatic of a tension between an artistic tug and a veristic pull. It is a shame that the latter wins out. Because Elizabeth I and Mary Queen of Scots famously never met, the film takes place in two parts: Mary in Scotland leading a life full of intrigue and adventure, and Elizabeth in London moping on the great misfortune of being tremendously wealthy in a time of incredible poverty. Ronan is typically solid as Mary, though the desire to make her a likeable protagonist somewhat erodes the complexity of the part. Her narrative is also rather uneven: her courtship with Jack Lowden’s Lord Darnley is painted in palates that flutter between heather-strewn sunlit highlands and sinister, dark castle corners. There is a lot of visual signposting nudging the viewer through a relationship that lasts only a few scenes. And in battle mode the film really stutters, presenting a bloodless, sub-Game of Thrones melee. It does feel like the qualitative stakes for adult medieval bloodshed have been raised of late, and Mary rather flounders in it. In London, Margot Robbie is doing her best to get that Supporting Actress Oscar by applying a lot of debeautifying make-up (presumably hoping to follow in the footsteps of Gary Oldman’s Academy Award for Best Actor in a Churchill mask). There is nothing much wrong with the performance, but there is little substance to it either, and it does seem to be being taken more seriously because it involves smallpox scarring. The film’s most obvious misstep (with the exception of an extraordinarily ill-judged and shrill cameo from David Tennant) comes towards its conclusion during a meeting between Mary and Elizabeth that is confected for the sake of the film. Again, it is not the irreverence that is the issue, but the presentation: Rourke’s theatre background comes through in a bizarre sequence that involves more hanging drapes than Cirque du Soleil, where the two women speak in trite riddles and never quite come face to face. If you are going to go down the whole ‘Mary and Elizabeth secretly met’ route, what’s the harm in owning it? The dreamy smoke and mirrors of this sequence are horribly out of place with the rest of the film. In the end, it’s more disappointing than bad. A great cast and an interesting period of history (even if it has been done to death on screens and in classrooms) wasted on a sombre muddle that wants to have both the gravity of Shakespeare and a fresh, dynamic perspective. As the film tells us, however, that sort of compromise is hard to achieve with two such opposing dogmas, and, as a result, this falls rather flat.